We started playing polo in Early 2007 and so some of us have been playing for about 3 and a half years now. We love it. Sometimes like in the winter people play less due to the shite weather and dark nights but as Spring approaches people come back and usually more people join us too. 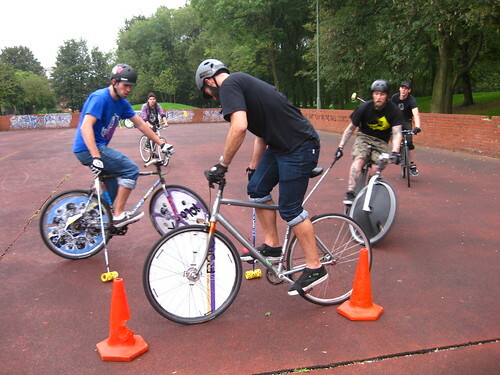 So there are always newbies coming and they are always welcomed and offered to try it out on someones bike and are offered a mallet to borrow until they get hooked and make their own and build or get a bike. Everyone is always welcome just bring a bike you don’t mind getting battered and a beer! People play on all kinds of bikes. Some on fixies, some on mountain bikes. I guess they both have plus points- mountain bikes are a bit tougher and can generally take more knocks whilst playing fixed enables better manouvreability. We don’t really mind what bike people play on and just encourage people to use a bike they feel comfortable playing on and one they don’t mind getting whacked with a ball or a mallet. When we first played we played with some wooden mallets we made out of brooms and bits of wood, then some of us got pro bike polo mallets from the US and now more and more of us play with the standard ski pole with pipe on the end. We often get together to make mallets. Contact us to find out when we’re doing it next.